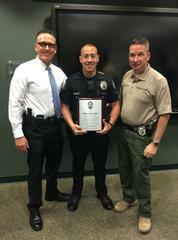 Officer Jordan Elders was recently recognized as Arcadia Police Department Officer of the Year 2016. For the last year and a half, Jordan has taken a lead role in addressing a growing transient population in Arcadia with the focus being on assistance and health. Jordan collaborated with local hospital staff and area law enforcement to obtain medical treatment, mental health assistance, and even relocation. In one particular case, Jordan was able to reunite a woman with her family in Pennsylvania where she remains to date, happy and sober. Captain Larry Goodman, Officer Jordan Elders, and Sergeant Brian Ortiz are pictured. 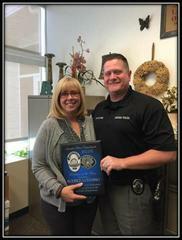 The Arcadia Police Department Civilian of the Year 2016 was awarded to Records Manager Audree Luevano. Audree received the highest number of nominations this year with all of them citing her hard and continuous work throughout the year in coordinating our transition into our new Records Management System. From selection, to implementation, to training, and updating…Audree’s work with our new Records Management System is both appreciated, and something we will all benefit from for many years to come. Records Manager Audree Luevano and Chief Bob Guthrie are pictured. We are proud of both Jordan and Audree and wish to congratulate both on their awards!